2001: A Space Odyssey can be interpreted about a million different ways. That's a big part of its appeal. But have you ever felt… hungry while watching it? That's because the movie is actually about food. Look closely, and you'll see it too! Audiences have always paid close attention to Stanley Kubrick's carefully crafted films, but the documentary Room 237 really brought the practice into focus. With The Shining having been analyzed down to the last detail, it's only natural to turn the focus to another of Kubrick's enigmatic masterpieces. 2001 is a movie people have made sport of interpreting since 1968. It may have polarized the critics (Pauline Kael famously called it "monumentally unimaginative"), but its popularity has endured, and it continues to fascinate. One angle that came to my attention after repeated viewings of the film, and a chance encounter with this clever essay from 2007 by Josh Ronsen, is this: Have you ever noticed the characters are constantly eating? That cannot be unintentional — this is Kubrick we're talking about here. During a recent screening at San Francisco's Castro Theatre, I could not get the idea out of my mind. Breakfast meetings! Trays laden with mushy portions! Sandwiches that might be chicken! And every time someone eats, something significant happens soon after! With a hat-tip to Ronsen and his hilarious observations, let's investigate further. In "The Dawn of Man," the ape colony is first seen munching on grass amid a herd of tapirs… until good old "Moongazer" realizes, as Richard Strauss orchestrations boom in the background, that he can use a bone as a weapon. He smashes the pile of bones at his feet, and then we see a tapir take a dive. Next scene: meat feast for everyone! It's implied, of course, that the sudden appearance of the monolith is what caused the ape-brain to realize how to craft, and deploy, a tool. But what if the monolith also transmitted the message that meat is delicious? And it makes you a badass, especially when you've got your newfound weapon in hand? Step off, you less-enlightened other apes… the water supply is ours and you are not invited to the pig pickin'. Many, many, many years later, Dr. Heywood Floyd is headed from Earth to the space station en route to the moon. Though the Pan Am shuttle comes standard with flight attendants wearing "grip shoes," there's no meal service, so one of the first things Floyd asks his space-station contact is "Do we have time for breakfast?" Fortunately, Howard Johnson's Earthlight Room beckons for a quick bite before heading up to Clavius Base, where another monolith awaits, looming like a giant diner menu in space. "Something like that. Tastes the same anyway." No wonder the monolith is righteously annoyed when they finally get to the crater. It taught pre-humans about the tasty benefits of being a carnivore eons ago, and now these dudes are chomping on sandwiches with simulated ingredients ("They're getting better at it all the time!") and the crusts cut off, followed by coffee served in what appear to be wasteful paper cups. Who really knows what its primary motive is in emitting an eardrum-exploding shriek of a radio signal toward Jupiter, but a little aural punishment for culinary offenses committed is certainly in order. As a side note: not everybody thinks those sandwiches look like they're made of plastic... or at least appreciates them for being revolting. Shoutout to this food blog and its author's appreciation for "grotesquely comforting space sandwiches." "Jupiter Mission," 2001's longest segment, is set 18 months later. Astronauts Dave and Frank have quite a lot to amuse themselves with on the long road to Jupiter (exercise, sit under the sun lamp, sketch, play chess, receive transmissions from home, watch news reports about themselves...) and of course eating is an important part of the day. So important, in fact, it's one of the first things we see them doing. A divided tray, similar to what Floyd was served on the way to Clavius, holds rectangles of food-like substance that pop, piping hot, out of the wall. Though it comes in different colors (mostly shades of brown), it all appears to have the approximate consistency of mashed potatoes, and is shoveled into the mouth with a long, thin, spork-like implement. There's no joy in eating here, no excitement like Floyd's delight over the sandwiches. Really, who can blame them? The only food that even looks appealing appears only on a TV screen, when Frank's parents dial in with long-distance happy birthday wishes, sitting behind a huge cake laden with candles. No cake for you, spaceman. The only character in these scenes who doesn't eat is HAL, for obvious reasons. Stay with me here, as I adjust my "this theory's getting a little wackadoo, so what?" hat, but perhaps HAL's inability to eat means he has to be destroyed before the next encounter with the monolith? 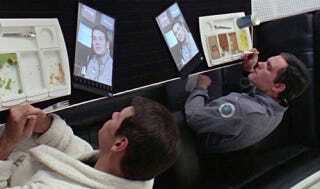 As soon as Dave shuts HAL down, the pre-recorded message pops up to inform the crew about the discovery on the moon, and its connection to Jupiter and the mission. Not long after, the space monolith appears. "Beyond the Infinite" we go, and whooooooo's hungry, because once Dave enters the antiques-in-the-cosmos series of rooms, he sees a man, who is actually an older version of himself, seated at a table. Eating. Frustratingly, we can't see exactly what he's noshing on, but it looks like the most civilized meal we've seen in the past two and a half hours. There are china plates that make old-school clinking noises, there's real silverware, there's a little bread plate with a roll on it. There's also a glass that breaks when it crashes to the floor. Old Dave reaches down, then Old Dave looks to the bed, where Even Older Dave lies. At the foot of the bed, the monolith towers. "You've finally had a good meal," it seems to say. "You may now pass into the beyond, and be reborn at a higher level. We'll just put that broken glass on your tab." Why are the dimensions of the monolith 1 to 4 to 9? Sit down: the answer will shock you. 1:4:9 are the proportions of ingredients in a recipe. What recipe? Those are the proportions of butter to half-and-half to sugar used in chocolate fudge, a bar of which the monolith resembles. Of course, we're still left wondering... what was in those "chicken" sandwiches? Tapir meat?